A year or so back, I built a King Island kayak and was amazed at how comfortable it was. Beam of the boat was 24 inches, depth at the rear of the cockpit was 15 inches, that is, the distance from the bottom of the keelson to the top of the cockpit rim. Length was about 15 feet. What made the boat so comfortable was the high coaming which made a very comfortable back rest. So I wanted to make a baidarka that was equally comfortable if not more so and was also capable of some sailing but could still be paddled at a reasonable clip. Of course, as everyone mariner knows if you try to build a boat that is good at more than one thing, you're likely to end up with a boat that is good at none of them. 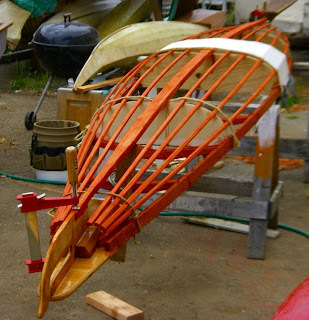 The design of the boat so far is as follows: Length of gunwales is 16 feet. LOA is about 18 feet. Beam is 32 inches. Depth to sheer at center is about 10 inches. As the picture above shows, the bottom is pretty flat. I intentionally laid the keel out flat to minimize the amount of vee in the hull. I will be adding an external keel about 1.5 inches deep. I don't have the sail plan worked out exactly yet, but it will probably look something like the sailplan that Ian Oughtred has designed for his interpretation of a McGregor sailing canoe. One more thing. The length of the cockpit will be 72 inches. I will be able to lay down in this boat and sleep. Providing of course that I will have some sort of anchor. Hence the name baidarko-lounger. I have also been reading about sailing canoes. They used to be all the rage about the time that the 19th century turned into the 20th. Then along came paved roads and everyone stopped sailing in canoes in favor of the new fad called bicycling. 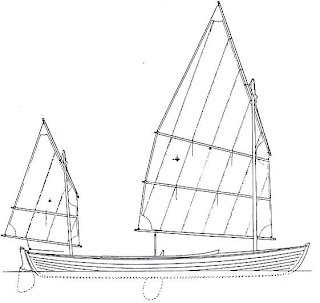 Anyway, the sailing canoes used to carry substantial amounts of ballast so they could carry more sail. A 60 pound centerboard made of steel plate was not uncommon. Not only was it heavy, it placed the weight about a foot below the keel of the canoe for maximum effect. Total ballast in these boats was as much as 120 lbs. So I'm going to look into ballast. Looking forward to seeing the finished Baidarkolounger! I've just been looking up 'canoe yawls' on the web and it would seem that there's a seamless transition in the development of 'sailing canoes' to what we now think of as 'canoe yawls', like the designs of Albert Strange, for example, or the very elegant craft developed and sailed by the Clyde Canoe Club in Scotland. Anyway, I hope you're not planning on putting a sixty pound centreplate in the Baidarkolounger . . .